This morning I woke up to the sound of my cell phone beeping messages about what was happening in Harare. The day started to roller-coaster forwards from there, fuelled by adrenaline and anxiety. While I was scrambling to get the pages of the blog to open up to add news received via sms and emails, the question going through my mind the whole time was ‘Will the opposition MDC call the rally off or not?’ At that stage my mind hadn’t reached far enough forwards to contemplate whether they might consider pulling out of the run-off. I felt genuinely frightened this morning, and at one point I said to a friend, “I am scared; today could be our ‘Sharpeville Massacre”. I wasn’t sure how the day would play out at all. In my mind I was imagining scenes of MDC supporters determinedly, stubbornly and bravely walking to the rally to be met with more than a thousand thugs armed with weapons and guided by the kind of brute arrogance that comes with knowing they can do what they like and not be punished. I imagined hundreds of innocent civilians being bloodily battered to pieces, possibly trapped within the confines of a stadium, hemmed in with nowhere to escape to. I was slightly shaking with anxiety but there was a part of my mind that had a sense of certainty that if this did happen, this brutal scene would be exactly the type of image (if captured on cameras) that would galvanise the Southern African community into action. Up until now, it hasn’t seemed to matter how many reports have been written, how many icons splattered on a map, how many terror albums compiled; nothing has been enough to force the Southern African community to make the kind of categorical unflinching statements we hope will be forthcoming. This morning I was talking about how the community entrusted with our lives needed to be shamed into action by the scenes of barbarism that people consider to be typically ‘African’ - ‘TIA’ as one of my colleagues keeps saying, to infuriate me. I didn’t want the bloodbath to take place and my heart this morning was saying “Stop the rally, don’t let it happen”. My head was in muddle though, fearful that the MDC leaders would be struggling with the same twisted logic my own head was engaging in, and I was fearful that they might believe a dramatic confrontation needed to happen. Now, with the announcement of the cancellation of the run-off sinking in, I am starting to think the horrible ethical dilemma posed by the stadium this morning symbolised the great challenge facing our country and facing those who have to make the terrible big decisions. Where do we draw the line because, God knows, it has to be drawn somewhere? The rally didn’t go ahead despite the fact the courts declared it should go ahead and it was entirely legal, even within Zimbabwe’s perverted legal system. The MDC didn’t call the people to push forward relentlessly and face the bullets, and as a result the world won’t see the type of images they crave, the type that stir the heart and lift the soul when they see a great human capacity to confront evil head-on – the ones Hollywood films thrive on. There will be no pictures of tanks rolling forwards to a solitary man, and no one standing up fearful but brave in the face of a gun, no one lying down peacefully while thugs exhaust themselves through violence on passive bodies. Make no mistake, my heart is heavy now; I am as seduced by bravery and drama as much as any other person. But my heart is heavy because the decision that has been taken is a massive one; the struggle just got harder and we have to think of new ways to battle on. The tools we relied on, the instruments of the law that we have constantly made use of to prove our intention to bring about the change our country through civilised means, have finally given up and broken in our hands. There are no spare parts in Zimbabwe to re-service any tools, far less for precious valuable ones like the rule of law, which is carefully crafted through the centuries. What died in Zimbabwe today was democracy, not hope: Robert Mugabe has finally killed democracy. He stands before us unhinged by his lust for power and determined to go forwards in a poll where he will be the only candidate. There is something about this image that disgusts me and makes me want to turn my eyes away from him because it is too embarrassing, even for someone who enjoys watching him fall flat on his face, to witness this level of pathetic desperation. I am consoled by one small point and that is that Robert Mugabe, the man who initially instilled pride in African people around the world for being a liberation hero, will end his days firmly labelled a despot. This last deathblow to freedom reveals him as an isolated individual, shameless and devoid of pride and dignity. He no longer even has the last rags of credibility and legitimacy that his previously rigged elections gave him - nothing to drape over and hide his grubby ambitions for power. I find bitter-sweet comfort in the fact that the last election Zimbabwe ever had that could be considered ‘free and fair’ enough to be marginally acceptable internationally, was the one where Robert Mugabe lost both the parliamentary and the presidential poll. Comfort too in the fact that it was those in the rural areas who finally turned their backs on him. Robert Mugabe will be damned by that, and he will be damned by his undignified scrabble for power regardless of the will of the people. While I know that there are people all around the world who are witnessing today’s events with deep sadness, I think we should all stop short of viewing this is the first step in a big win for Robert Mugabe and Zanu PF. It is Pyrrhic victory, and the full weight of what it will cost him and his party is yet to be determined. What happens when Mugabe crowns himself King again on Friday, despite the fact he polled less votes than his rival on March 29th? What happens when he has to contend with presiding over a parliament dominated by elected MDC members voted for by the people? How many dignitaries will fly in and be brave enough to eat and feast and celebrate his sordid win with him at a farce of an inauguration ceremony? How many people will want to stand so close to a man who stinks of corruption? None of this addresses the critical choice that has been made by the MDC leaders today, a day that I know will be one of those historical markers in our nation’s history. The decision that Morgan Tsvangirai has made today is probably the very opposite of the one that Robert Mugabe would make if he was wearing Tsvangirai’s shoes. Robert Mugabe is a sadist: he unflinchingly wreaks the worst kind of brutality on his people. In contrast, today has shown us that Morgan Tsvangirai is clearly a man who carries the burden of moral responsibility more heavily, and he has decided that he is not the kind of leader who can ask his people to die in his battle to win a leadership contest. The sentence which stands out for me in the MDC press statement is this: “We in the MDC cannot ask them to cast their vote on June 27 when that vote will cost them their life”. 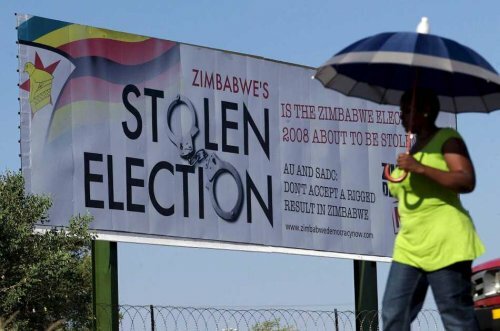 It isn’t simply about voting: the fact is that the changes in Zimbabwe’s legislation which made it possible for the opposition movement to thwart Mugabe’s tried and trusted rigging tricks unfortunately also handed Mugabe and his thugs a roadmap to all his victims. By displaying the polling results on the walls outside the polling stations - the scores on the doors - the world and Zimbabwean citizens knew the result before it had been processed by Zanu PF’s creative number-crunching team, and made it difficult for him it to rig. But it also told Mugabe, right down to the wards within towns, who voted against him, and where they lived. Those people who crave the images of bravery I mentioned before should hold this picture in their minds: a poor person standing in a polling station, casting a vote against a violent dictator, despite the fact they live in a rural area. There’s your man courageously facing a bullet with dignity! On March 29th the gun was being held behind Mugabe’s back, ready to whip out and use against a civilian when he needed it to be used. The June 27th elections are different: this time the gun would have almost literally been held to civilian heads because those brave people were being asked to cast their votes before the hard cruel eyes of the Zanu PF loyalists that the government has recruited and flooded the polling stations with. How many times should people who are growing poorer by the day be asked to face a gun simply to prove a point to an incalcitrant regional community? When can we all conclude that they have faced the bullet enough times to say, ‘OK, we’ve shown you we have done all we can, and now it’s over to you’? I didn’t have to make the decision that was made today, but I can understand why it was made, and respect the decision that was taken, even if I am not completely sure yet that it was the right one. But I am not stupid either: Mugabe is about as vicious as they come and I am sure that refusing to participate in the elections will not bring an end to the terror despite any suggestion to that effect in the MDC statement. There is no doubt in my mind that Mugabe will continue to bludgeon people, to firmly and thoroughly smash the opposition movement and human rights groups into submission, and to try and drive them out of the country. The Mugabe I have come to know will now be strategising on ways forward to ensure he never ever has to lose one of his own rigged elections again. Having said that, it is equally true to say that if the MDC had participated in this next election that that wouldn’t have stopped the violence either. Mugabe will never go quietly: he has told us clearly that only God can take him out of power, so this aging lunatic means to take our nation literally to a the point of genocide if he loses. If that happened it would be a vicious one-sided bloodbath. There is no easy way for the MDC to contend with the political violence heaped on a civilian population. In relation to political violence and the elections, they were damned if they did, but also damned if they didn’t participate. The decision to withdraw, for me, is better understood in terms of the first part of the sentence rather than the second: “We in the MDC cannot ask them to cast their vote on June 27 when that vote will cost them their life”. This isn’t about saving lives because no decision is likely to stop the butcher from continuing to butcher people. This decision says more to me about the MDC’s inability to ASK people to do something that they know will be used as justification to kill people (“We [...] cannot ask them”) . This decision may not save lives but it does mean that Mugabe now needs to find a different excuse for beating people than the one he has relied on up until now: “You voted for the MDC” no longer applies, and now he has to slash and cut people simply because they exist, and simply because he is losing power. I freely admit that if I had to make a choice between having a ruthless leader who could unflinchingly lead his people to their deaths like lambs to slaughter, or one that who cares enough to step back from the heat to try and save a few lives, I would choose the latter. I am sickened by the violence and I want our nation to have a leader that cares more for the lives of the people than he does for power. Mugabe isn’t that man and the nation voted to give Morgan Tsvangirai the chance to prove he was. This decision to withdrar certainly shows that Tsvangirai doesn’t have a taste for sacrificing lives or for using violence as the means to gain power and I am glad for that. Whether the decision he has made takes us all one step closer to lasting peace or not is still to be determined. There are some phrases that have been written so many times over the last few years that they start to sound like hollow clichés, and one of them is “This is a challenge to SADC (Southern African Development Community) ”. The decision made by the MDC leaders passes on massive responsibility to the SADC community. Today is the day democracy died in Zimbabwe, but there is no getting away from the fact that it is a death that SADC – and especially Thabo Mbeki – has presided over and watched happen before their eyes. I can’t imagine how SADC can endorse Robert Mugabe as Zimbabwe’s leader and still retain any modicum of integrity in the eyes of the world as a body that takes peer review seriously. I can’t imagine how they can watch Mugabe use the senatorial seats in his gift to develop an upper house that can overrule the democratically elected majority in the lower house, and also claim that they have watched the will of the people prevail. How will any SADC nation ever be able to say that they give a damn about democracy and human rights, and that they are able to manage their own affairs in this area, if they allow a man to murder, torture and steal his way to power before the world’s eyes? SADC holds Zimbabwean lives in its hands now: Mugabe long ago addicted responsibility for his people and cast them into the darkness, and the MDC have now stepped back and placed themselves alongside the people who have done all they can but have run out of options. SADC has to respond. They now have to do something that will not only resolve the Zimbabwean crisis but also re-ignite faith in African politics. The last thing that gives me some measure of comfort is derived from the “long view” I take of things: I am glad the MDC didn’t stay in this battle until the country reached a point where civilians had no choice but to take up weapons against the leadership to defend their own lives. I am glad they didn’t hand Mugabe the one thing that might have “balanced” his use of violence, and that would be to give him the excuse that the violence was “mutual” and he was not entirely responsible for it. I was beginning to feel – especially this morning – that Mugabe was becoming more and more extreme in a bid to taunt the MDC into retaliating. There is still a chance that violence might spiral out of control as brutalised people grow more desperate, but if it does happen, it happens under SADC’s watch. They can stop it and they can also restore democracy to Zimbabwe and give us a new lease of life; the question now is whether they have the political will and moral fibre to do so. As for the rest of us, we will struggle on as we always have done.